I am constantly surprised by how many food bloggers are afraid to try yeast baking. I guess I’m going to have to just show you. Here’s the recipe I used from King Arthur Flour with what I actually did is in italics. “3 cups” is really just a guideline. You may need more; you may need less. Personally, I dumped the contents of my flour canister into the bowl then threw in a little more from the bag when the dough was still sticky. I was out of milk. I used… I’d guess a couple tablespoons of evaporated milk and some warm water to make a cup. I took the butter out of the fridge, melted a piece and called it 2 tablespoons. I was actually out of salt and made this loaf while waiting for FreshDirect to arrive. There was some in the box, so I ripped it open and shook what was left into the bowl. Done and done. This I measured, as should you. Baking: Bake the bread in a preheated 350°F oven (My oven runs a little cold, so it was more like “somewhere between 350° and 375°.”) for 30 to 35 minutes, until it’s light golden brown. Test it for doneness by removing it from the pan and thumping it on the bottom (it should sound hollow), or by measuring its interior temperature with an instant-read thermometer (it should register 190°F at the center of the loaf). Remove the bread from the oven, and cool it on rack before slicing. (Yeah, good luck to you if you think you can wait until the bread is totally cooled before cutting a slice.) Store the bread in a plastic bag at room temperature. 1. I didn’t measure my ingredients. 2. I haphazardly kneaded the dough. 3. I probably didn’t let it rise enough the first time. 4. I let it rise even longer the second time. 5. I had only a vague sense of my oven temperature. If this was a pie crust, I would have thrown it out three times already. The crumb’s a little uneven, but come on. That bread is more or less perfect. Now will you try baking with yeast? Kudos to you on a fab title for this post! I’m with you! It is always puzzling when food bloggers who routinely make billion layer cakes and meringue and all sorts of complicated desserts fear yeast. Not to mention the fact that paying around with yeast is one of the cheapest things you can do in the kitchen, no expensive chocolate to ruin etc. I’ve never been big on baking. Partly out of the fear you mentioned—I always thought voodoo, special incantations or at least a secret handshake was involved—and partly out of lack of interest. Your lovely post and obviously beautiful results have demolished both my objections, Kirsten. I don’t know whether to thank or curse you. 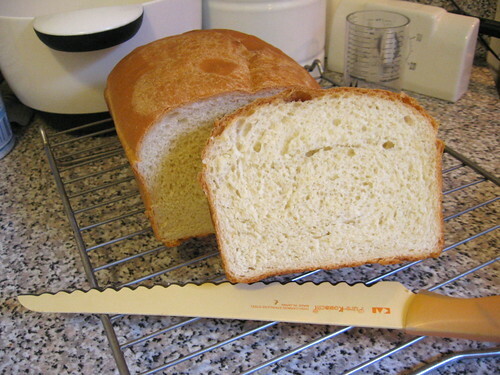 Baking yeast bread is SO easy – I don’t know why more people don’t do it. Whenever I tell people I make my own bread they look at me as if I was crazy. Using a stand mixer makes it SO easy, just toss all the ingredients in and let the dough hook go at it for a few minutes. Baguettes are even easier than sandwich bread and all you need is yeast, flour, water, and salt. Perfect bread. I use yeast all the time. You seem to have used a tried yeast. In Finland we have this “fresh” yeast at stores. I do not know if that is rare? Congrats for you. Good result! 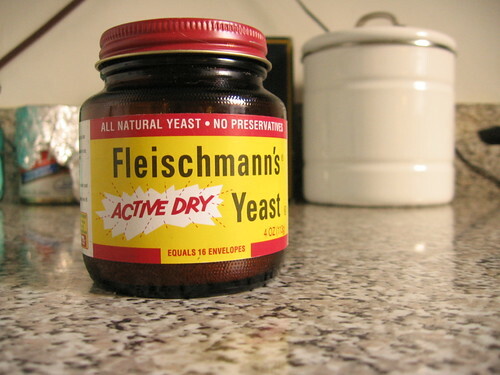 In the US, fresh yeast is very rare and most home bakers used the dried granules of yeast. I have heard that in Europe, though, most people use fresh yeast. Pingback: don't fear the yeaster! on Flickr - Photo Sharing!